“At that time Michael, the great prince, the protector of your people, shall arise. 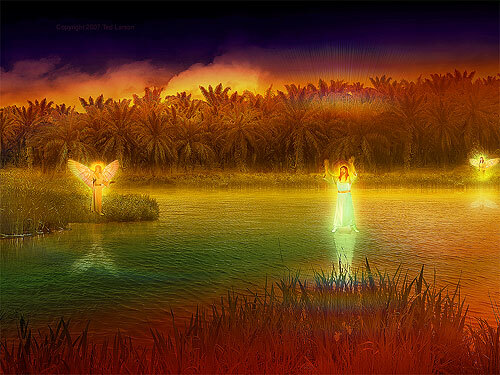 The angel Michael is often associated with spiritual battle (Daniel 10:13, Daniel 10:21, Jude 1:9, and Revelation 12:7). Since Michael is called the archangel (Jude 1:9), he is Satan’s true opposite. Satan is not the opposite of Jesus; he is the opposite of Michael, this high-ranking angel. In addition to his role as a spiritual warrior, Michael has a special job in protecting Israel. God appointed Michael as a spiritual guardian over Israel. There shall be a time of anguish, such as has never occurred since nations first came into existence. This refers to the time of persecution for Israel and world calamity known as the Great Tribulation. This period is also called the time of Jacob’s trouble in Jeremiah 30:7. The Jewish people have known many a time of trouble through their history. From the horrors at the fall of Samaria and Jerusalem to the terrors wrought by Antiochus Epiphanes, to the destruction of Jerusalem by the Romans, to the persecutions from the church during the Dark Ages, to the pogroms of Europe, to the 20th Century Holocaust, it often seems that all Israel’s history has been a time of trouble. Yet this time of trouble will be different. This will be a worse time of trouble than Israel has ever seen before. Jesus quoted this passage in Matthew 24:21: For then there will be great tribulation, such as has not been since the beginning of the world until this time, no, nor ever shall be. With great sadness, we must say that the Bible teaches that the worst has yet to come. Despite the terrors of that time, deliverance is assured. No matter how great the attack is against the Jewish people, God promises to preserve them. He will never break His promise to Abraham: And I will establish My covenant between Me and you and your descendants after you in their generations, for an everlasting covenant, to be God to you and your descendants after you (Genesis 17:7). everyone who is found written in the book. 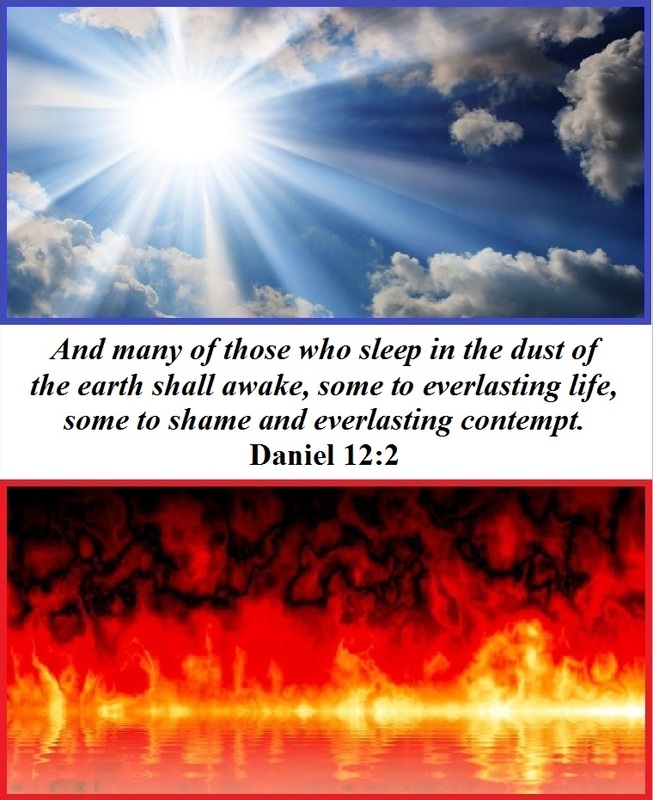 2 Many of those who sleep in the dust of the earth shall awake, some to everlasting life, and some to shame and everlasting contempt. 3 Those who are wise shall shine like the brightness of the sky, and those who lead many to righteousness, like the stars forever and ever. Do everything without grumbling or arguing, so that you may become blameless and pure, children of God without fault in a warped and crooked generation. 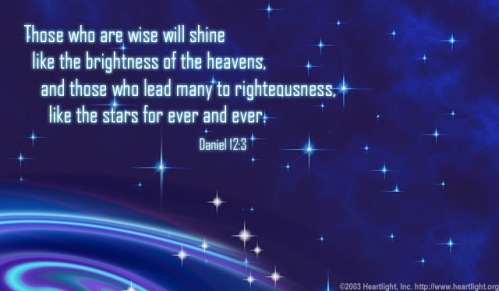 Then you will shine among them like stars in the sky as you hold firmly to the word of life. And then I will be able to boast on the day of Christ that I did not run or labor in vain. 5 Then I, Daniel, looked, and two others appeared, one standing on this bank of the stream and one on the other. Vision on the Tigris. digital art by Ted Larson. 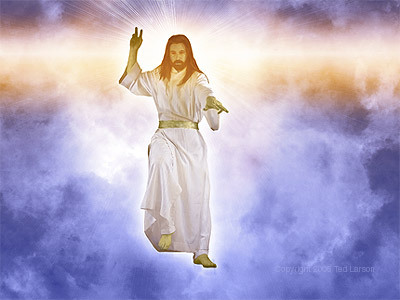 6 One of them said to the man clothed in linen, who was upstream, “How long shall it be until the end of these wonders?” 7 The man clothed in linen, who was upstream, raised his right hand and his left hand toward heaven. And I heard him swear by the one who lives forever that it would be for a time, two times, and half a time, and that when the shattering of the power of the holy people comes to an end, all these things would be accomplished. –Every man has his way to go. –Every man has an end. –There is a rest provided for the people of God. –There is an inheritance for the people of God. “O Love that wilt not let me go” was written by the blind Scottish preacher George Matheson over 130 years ago. He believed, and so can we, that God’s love will not let us go –– that God’s light will follow us all our way –– that God’s joy will seek us through our pain –– and that our faith will make all the difference, because God is faithful! Daniel lived physically as a foreigner in a far-off land, but spiritually he was at home with God all his life long. What is pressing you now? Take courage today, and pray this song, HERE. You, too, will shine like the stars as you trust in the One who is Love! 21 In his place shall arise a contemptible person on whom royal majesty had not been conferred; he shall come in without warning and obtain the kingdom through intrigue. This was fulfilled in the successor of Seleucis III, named Antiochus IV. He did not come to the throne legitimately because it was strongly suspected that he murdered his older brother, the previous king. The other potential heir (the son of Seleucus III) was imprisoned in Rome. This was fulfilled when Antiochus Epiphanes carried on the feud between the dynasties but pretended friendship and alliance to catch them off guard. Despite massive efforts and epic battles, Antiochus Epiphanes did not stand, and his army was swept away. The defeat of Antiochus Epiphanes at his second campaign against Egypt was important, because Egypt beat Antiochus with the help of Rome. At the end of it all, Antiochus Epiphanes and his kingdom were under the dominion of Rome. In a famous battle, the Roman Navy defeated the navy of Antiochus Epiphanes. After the battle, a Roman general drew a circle around Antiochus in the dirt and demanded to know if he would surrender and pay tribute to Rome – and demanded to know before he stepped out of the circle. From that point on there was no doubt: Antiochus Epiphanes took his orders from Rome and was under Roman dominion. 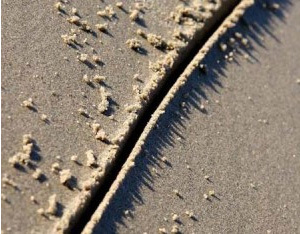 Hence the expression to draw a line in the sand. for plots shall be devised against him 26 by those who eat of the royal rations. They shall break him, his army shall be swept away, and many shall fall slain. 27 The two kings, their minds bent on evil, shall sit at one table and exchange lies. But it shall not succeed, for there remains an end at the time appointed. 28 He shall return to his land with great wealth, but his heart shall be set against the holy covenant. He shall work his will, and return to his own land. This was fulfilled when Antiochus Epiphanes returned from Egypt, bitter from defeat. He vented his anger against Jerusalem, which was already shaken because Antiochus sold the office of High Priest and persecuted the Jewish people to conform to Greek culture, forsaking the faith and traditions of their fathers. 29 “At the time appointed he shall return and come into the south, but this time it shall not be as it was before. 30 For ships of Kittim shall come against him, and he shall lose heart and withdraw. He shall be enraged and take action against the holy covenant. He shall turn back and pay heed to those who forsake the holy covenant. 31 Forces sent by him shall occupy and profane the temple and fortress. They shall abolish the regular burnt offering and set up the abomination that makes desolate. Antiochus Epiphanes set up an image of Zeus at the temple altar. He demanded sacrifice to this image, and later desecrated the temple by sacrificing a pig on it. 32 He shall seduce with intrigue those who violate the covenant; but the people who are loyal to their God shall stand firm and take action. 33 The wise among the people shall give understanding to many; for some days, however, they shall fall by sword and flame, and suffer captivity and plunder. In his attack on Jerusalem Antiochus IV is said to have killed 80,000 Jews, taken 40,000 more as prisoners, and sold another 40,000 as slaves. He also plundered the temple, robbing it of approximately $1 billion by modern calculations. 34 When they fall victim, they shall receive a little help, and many shall join them insincerely. 35 Some of the wise shall fall, so that they may be refined, purified, and cleansed, until the time of the end, for there is still an interval until the time appointed. 36 “The king shall act as he pleases. He shall exalt himself and consider himself greater than any god, and shall speak horrendous things against the God of gods. He shall prosper until the period of wrath is completed, for what is determined shall be done. 37 He shall pay no respect to the gods of his ancestors, or to the one beloved by women; he shall pay no respect to any other god, for he shall consider himself greater than all. 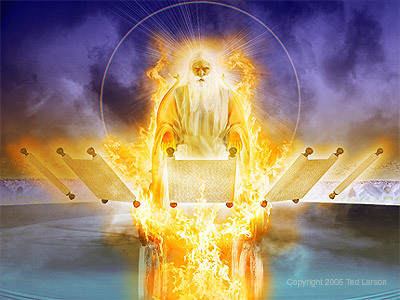 38 He shall honor the god of fortresses instead of these; a god whom his ancestors did not know he shall honor with gold and silver, with precious stones and costly gifts. 39 He shall deal with the strongest fortresses by the help of a foreign god. Those who acknowledge him he shall make more wealthy, and shall appoint them as rulers over many, and shall distribute the land for a price. The precise points may be cloudy, but the general idea is clear. The end will be marked by great conflict, culminating in the world’s armies gathering in the Promised Land to do final battle. Ultimately there is no hope for the Antichrist or for any of his followers. 40 “At the time of the end the king of the south shall attack him. But the king of the north shall rush upon him like a whirlwind, with chariots and horsemen, and with many ships. He shall advance against countries and pass through like a flood. 41 He shall come into the beautiful land, and tens of thousands shall fall victim, but Edom and Moab and the main part of the Ammonites shall escape from his power. 42 He shall stretch out his hand against the countries, and the land of Egypt shall not escape. 43 He shall become ruler of the treasures of gold and of silver, and all the riches of Egypt; and the Libyans and the Ethiopians shall follow in his train. 44 But reports from the east and the north shall alarm him, and he shall go out with great fury to bring ruin and complete destruction to many. 45 He shall pitch his palatial tents between the sea and the beautiful holy mountain. Yet he shall come to his end, with no one to help him. I hope you were paying attention in your ancient history classes at school! As for me, in the first year of Darius the Mede, I stood up to support and strengthen him. 2 “Now I will announce the truth to you. Three more kings shall arise in Persia. The Persian Empire tried to wipe out the Jewish people during the reign of the Persian King Xerxes, through the plot of Haman (as shown in the Book of Esther). The fourth shall be far richer than all of them, and when he has become strong through his riches, he shall stir up all against the kingdom of Greece. The Greek Empire tried to wipe out the Jewish people during the reign of Antiochus IV, when he attempted to kill every Jew who did not renounce their commitment to God and embrace Greek culture. 3 Then a warrior king shall arise, who shall rule with great dominion and take action as he pleases. 4 And while still rising in power, his kingdom shall be broken and divided toward the four winds of heaven, but not to his posterity, nor according to the dominion with which he ruled; for his kingdom shall be uprooted and go to others besides these. 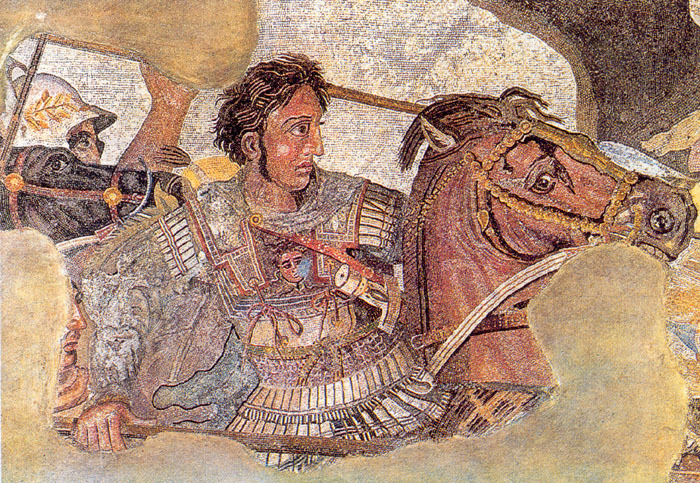 After Alexander’s death, none of his descendants succeeded him. Alexander left three possible heirs: a half brother named Philip, who was mentally deficient; a son who was born after Alexander died; and an illegitimate son named Hercules. The half-brother and the posthumous son were first designated co-monarchs, each with a regent. But fighting among the regents eventually resulted in the murder of all possible heirs. After the death of all Alexander’s possible heirs, four generals controlled the Greek Empire. 5 “Then the king of the south shall grow strong, but one of his officers shall grow stronger than he and shall rule a realm greater than his own realm. This was fulfilled in Ptolemy I of Egypt, who exerted his control over the Holy Land. Soon after the division of Alexander’s Empire, the Ptolemies dominated this region. Ptolemy I had a prince named Seleucus, who rose to power and took dominion over the region of Syria. He became more powerful than his former Egyptian ruler. The Seleucids are identified with the Kings of the North, and the Ptolemies were the Kings of the South. 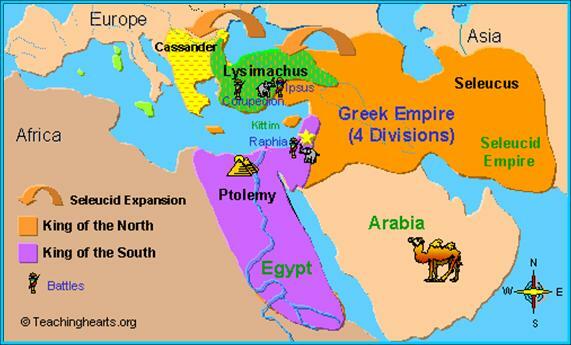 The dynasties of the Seleucids and the Ptolemies fought for some 130 years. The stronger of the two always held dominion over the Holy Land. 6 After some years they shall make an alliance, and the daughter of the king of the south shall come to the king of the north to ratify the agreement. This was fulfilled in the marriage between Antiochus II (of the Seleucids) and Berenice (daughter of Ptolemy II). There was peace for a time because of this marriage, but it was upset when Ptolemy II died. Once Ptolemy II died, Antiochus II put away Berenice and took back his former wife, Laodice. and his offspring shall not endure. She shall be given up, she and her attendants and her child and the one who supported her. Laodice didn’t trust her husband Antiochus II; so she had him poisoned. After the murder of Antiochus II, Laodice had Berenice, her infant son, and her attendants killed. After this reign of terror, Laodice set her son (Selecus II) on the throne of the Syrian dominion. “In those times 7 a branch from her roots shall rise up in his place. He shall come against the army and enter the fortress of the king of the north, and he shall take action against them and prevail. This was fulfilled in the person of Ptolemy III, who was the brother of Berenice (the branch of her roots). Avenging the murder of his sister, Ptolemy III invaded Syria and humbled Selecus II. 8 Even their gods, with their idols and with their precious vessels of silver and gold, he shall carry off to Egypt as spoils of war. For some years he shall refrain from attacking the king of the north; 9 then the latter shall invade the realm of the king of the south, but will return to his own land. 10 “His sons shall wage war and assemble a multitude of great forces, which shall advance like a flood and pass through, and again shall carry the war as far as his fortress. This was fulfilled in Seleucus III and Antiochus III, the two sons of Seleucus II. Both were successful generals, but Seleucus III ruled only a short time and was succeeded by his brother. In a furious battle, Antiochus III took back the Holy Land from the dominion of the Ptolemies. 11 Moved with rage, the king of the south shall go out and do battle against the king of the north, who shall muster a great multitude, which shall, however, be defeated by his enemy. 12 When the multitude has been carried off, his heart shall be exalted, and he shall overthrow tens of thousands, but he shall not prevail. This was fulfilled when Antiochus III was defeated at the battle of Raphia. Because of that loss he was forced to give back dominion over the Holy Land to Ptolemy IV. 13 For the king of the north shall again raise a multitude, larger than the former, and after some years he shall advance with a great army and abundant supplies. 14 “In those times many shall rise against the king of the south. The lawless among your own people shall lift themselves up in order to fulfill the vision, but they shall fail. 15 Then the king of the north shall come and throw up siegeworks, and take a well-fortified city. And the forces of the south shall not stand, not even his picked troops, for there shall be no strength to resist. 16 But he who comes against him shall take the actions he pleases, and no one shall withstand him. He shall take a position in the beautiful land, and all of it shall be in his power. This was fulfilled when Antiochus III invaded Egypt again, gaining final control over the armies of Ptolemy V and over the Holy Land. Jews living in the Holy Land helped Antiochus III because the Jewish people resented the rule of the Egyptian Ptolemies. This decision later proved unwise. 17 He shall set his mind to come with the strength of his whole kingdom, and he shall bring terms of peace and perform them. 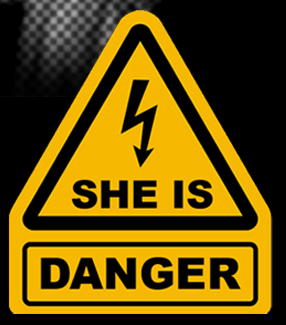 In order to destroy the kingdom, he shall give him a woman in marriage; but it shall not succeed or be to his advantage. 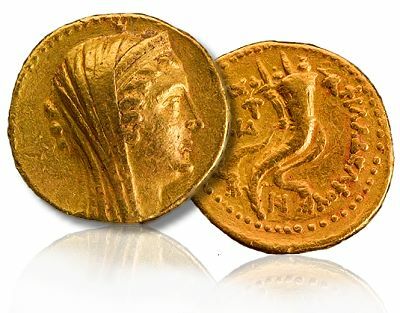 An extremely rare ancient gold coin was uncovered in 2010 in the excavations of the University of Michigan and University of Minnesota at Tell Kedesh in Israel near its Lebanese border. 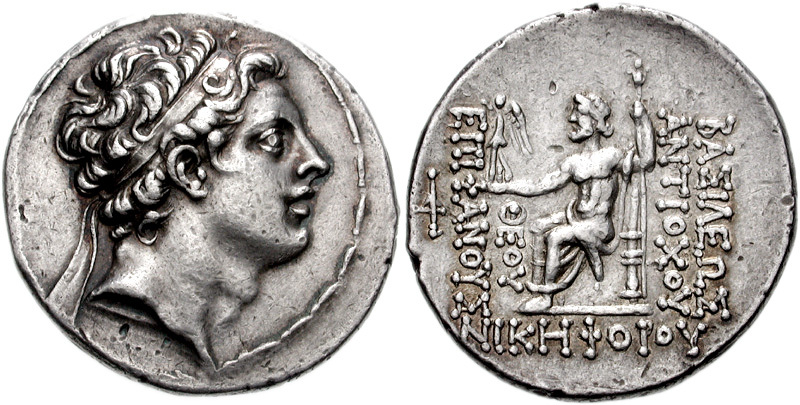 The coin is 2,200 years old and was minted in Alexandria, Egypt in 191 BCE. The Israel Antiquities Authority says the coin is the heaviest and has the highest contemporary value of any coin ever found in an excavation in Israel. 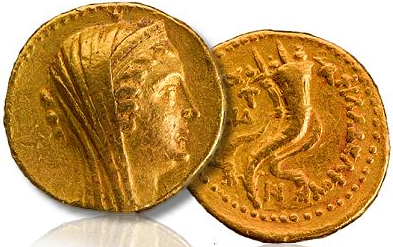 The coin weighs almost one ounce (27.71 grams), while most ancient gold coins weighed 4.5 grams. The denomination is called a mnaieion, meaning a one-mina coin, and is equivalent to 100 silver drachms, or a mina of silver. It is plausible that the second-century BCE mnaieia actually depict cryptic portraits of the reigning queens. Consequently, the queen represented on the Tell Kedesh mnaieion may actually be Cleopatra I, daughter of Antiochus III, whose marriage to Ptolemy V in 193 sealed the formal end of the Fifth Syrian War. 18 Afterward he shall turn to the coastlands, and shall capture many. But a commander shall put an end to his insolence; indeed, he shall turn his insolence back upon him. 19 Then he shall turn back toward the fortresses of his own land, but he shall stumble and fall, and shall not be found. This was fulfilled when Antiochus III turned his attention towards the areas of Asia Minor and Greece. He was helped by Hannibal, the famous general from Carthage. But a Roman General, Lucius Cornelius Scipio, defeated Antiochus in Greece. Antiochus planned to humiliate Greece but was humiliated instead. He returned to his former regions, having lost all that he gained and died shortly after. After this defeat Antiochus III had an inglorious end. Needing money badly for his treasury, he resorted to pillaging a Babylonian temple and was killed by enraged local citizens. 20 “Then shall arise in his place one who shall send an official for the glory of the kingdom; but within a few days he shall be broken, though not in anger or in battle. 21 In his place shall arise a contemptible person on whom royal majesty had not been conferred; he shall come in without warning and obtain the kingdom through intrigue. After the inglorious end of the king of the North, his successor, Seleucus III, the eldest son of Antiochus III, would raise taxes and meet a soon end. Seleucus III was assassinated, probably by his brother Antiochus IV, a vile and contemptible person. By this time, the first wave of exiles had returned to Jerusalem under the leadership of Ezra (Ezra 1-2). a word was revealed to Daniel, who was named Belteshazzar. The word was true, and it concerned a great conflict. He understood the word, having received understanding in the vision. 2 At that time I, Daniel, had been mourning for three weeks. 3 I had eaten no rich food, no meat or wine had entered my mouth, and I had not anointed myself at all, for the full three weeks. Some think that Daniel was in mourning because so few Jews had returned with Ezra from exile. 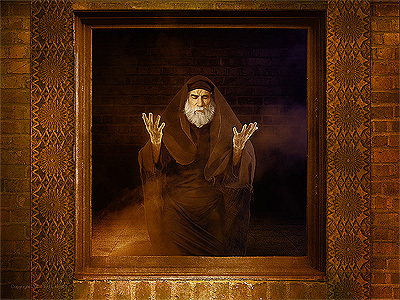 Others believe it was because Ezra faced severe opposition in rebuilding the temple. Daniel did not go back with Ezra’s group of exiles because he was about 84 years old at this time. Daniel could serve the exiles better from his high position in government than he could with them in Jerusalem. 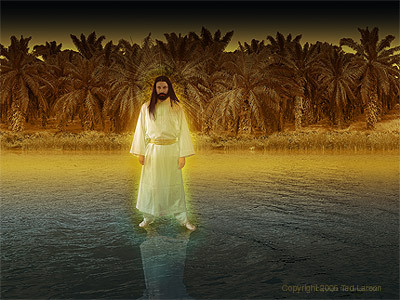 4 On the twenty-fourth day of the first month, as I was standing on the bank of the great river (that is, the Tigris), 5 I looked up and saw a man clothed in linen, with a belt of gold from Uphaz around his waist. 6 His body was like beryl, his face like lightning, his eyes like flaming torches, his arms and legs like the gleam of burnished bronze, and the sound of his words like the roar of a multitude. The Man upon the Waters. digital art by Ted Larson. 7 I, Daniel, alone saw the vision; the people who were with me did not see the vision, though a great trembling fell upon them, and they fled and hid themselves. 8 So I was left alone to see this great vision. My strength left me, and my complexion grew deathly pale, and I retained no strength. 9 Then I heard the sound of his words; and when I heard the sound of his words, I fell into a trance, face to the ground. 10 But then a hand touched me and roused me to my hands and knees. 11 He said to me, “Daniel, greatly beloved, pay attention to the words that I am going to speak to you. 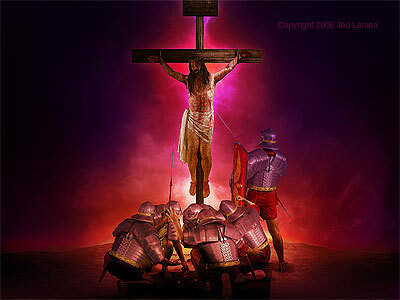 Stand on your feet, for I have now been sent to you.” So while he was speaking this word to me, I stood up trembling. 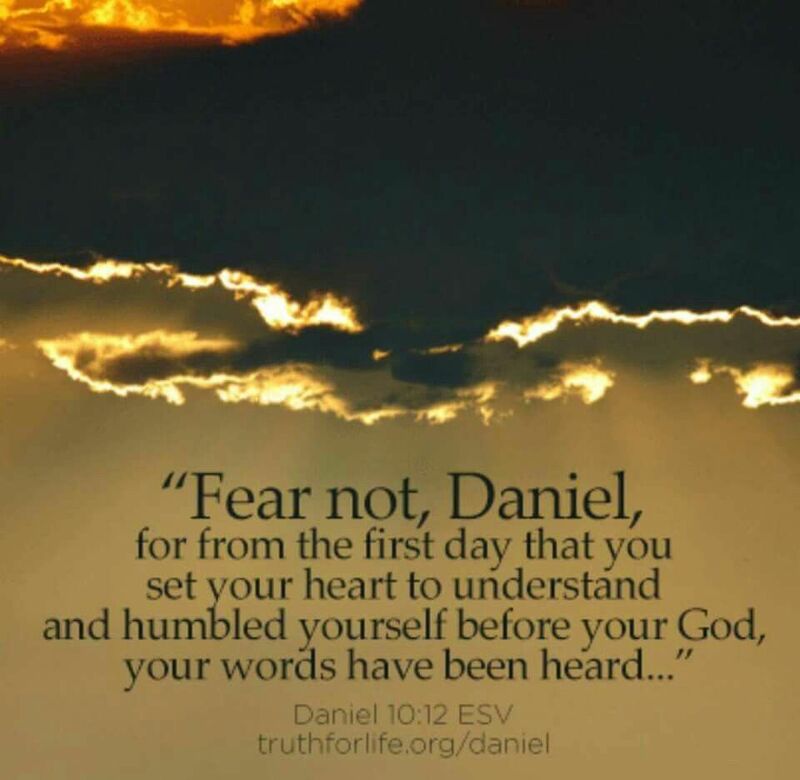 12 He said to me, “Do not fear, Daniel, for from the first day that you set your mind to gain understanding and to humble yourself before your God, your words have been heard, and I have come because of your words. We can’t pass this over lightly. 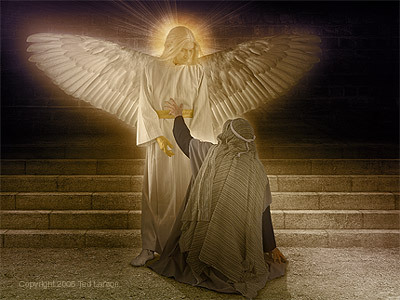 An angel was dispatched because of Daniel’s prayer. This is another of many reminders in the Book of Daniel that prayer matters. It isn’t merely a therapeutic exercise for the one who prays. Since this prince was able to oppose the angelic messenger to Daniel, we know this was more than a man. This prince was some kind of angelic being, and we know he was an evil angelic being because he opposed the word of God coming to Daniel and stood against the angelic messenger. The great question is—What is the secret of spiritual strength? How is it to be attained? Notice the order of the words of the heavenly messenger when he spoke to Daniel. They are suggestive. He places ‘peace’ before ‘strength.’ ‘Strength’ must have a foundation. And as you feel quite at peace with God, you have a foundation. In this, as in everything else, pardon come first. Then you are upon a rock. There must be quietness: and there is no real quietness till the soul sits pardoned at the feet of Christ. I. Therefore the beginning of ‘strength’ is to be at peace.—Do not doubt God’s love. Accept, as a sinner, the free grace of the sinner’s Friend. And do not be afraid to be happy. Then, having Christ, you can fulfil the Apostle’s command to the Ephesians, ‘Be strong.’ But St. Paul does not only say ‘Be strong,’ for that would be mockery, but he adds that which makes it possible,—‘Be strong in the Lord.’ Now, what does that mean? II. It is to have ‘the Word’ drawn upon, and its promises.—‘Be strong in the written Word.’ Work with the promises, and you will be ‘strong.’ No one who has not yet tried it can tell how the Bible, or even one verse of the Bible, can strengthen a man—his intellect, his will, his affections. If a man will but let God’s Word come in, and sink, and dwell in his heart, it will do its own work there of itself, and make you a strong character. III. Then there is the Presence of Christ.—Think what it would be—if we could only realise it—if you had Christ always at your side. ‘Fear not! I am with you.’ How brave and strong a little child can be when it holds a hand it loves! Moses: ‘If Thy Presence go not with us, take us not up hence.’ ‘My Presence shall go with thee, and I will give thee rest,’ that is ‘strength.’ Christ with us. V. But there is a further secret of strength—exercise, the use, the faithful use of what you possess.—The agitation of the tree strengthens the branch, and makes the root firmer. Here, then, are five great strengtheners; peace, the Word of Christ, the Presence of Christ, and union with Christ, and an active, useful life. 20 Then he said, “Do you know why I have come to you? Now I must return to fight against the prince of Persia, and when I am through with him, the prince of Greece will come. 21 But I am to tell you what is inscribed in the book of truth. There is no one with me who contends against these princes except Michael, your prince.. I once thought it was the great preachers or those people who could give substantial sums of money who were the most effective Christians. I am convinced now that the most sacred and creative thing, the greatest work any person can ever do, is to thank God, to praise him, and to pray. The person sitting in a wheelchair in grateful praise and adoration may be of more value to God than anyone else in his kingdom. God does not play favorites, nor does he throw people away. No one need be useless. All of us can be thankful and pray. There is power in thankfulness and prayer. In the first year of Darius son of Ahasuerus, by birth a Mede, who became king over the realm of the Chaldeans— 2 in the first year of his reign, I, Daniel, perceived in the books the number of years that, according to the word of the Lord to the prophet Jeremiah, must be fulfilled for the devastation of Jerusalem, namely, seventy years. When exactly did the seventy years begin? At the time of the destruction of the temple by Nebuchadnezzar? The time of Daniel’s own captivity? Or is it to be understood as a round number for a human lifetime? Opinions vary. 3 Then I turned to the Lord God, to seek an answer by prayer and supplication with fasting and sackcloth and ashes. This implies determination in prayer. Daniel had an objective to achieve in prayer, and he approached God as a man who would not be denied. He did this because he was rightly convinced that his prayer was in the will of God, and knew it was not motivated by any selfish desire. Daniel wasn’t passive as God’s prophetic plan unfolded before him. In his approach to God, he made a request, asking God to perform His promise in the way that Daniel thought would bring God most glory. The Prayer of Daniel. digital art by Ted Larson. “Ah, Lord, great and awesome God, keeping covenant and steadfast love with those who love you and keep your commandments, 5 we have sinned and done wrong, acted wickedly and rebelled, turning aside from your commandments and ordinances. 6 We have not listened to your servants the prophets, who spoke in your name to our kings, our princes, and our ancestors, and to all the people of the land. 7 “Righteousness is on your side, O Lord, but open shame, as at this day, falls on us, the people of Judah, the inhabitants of Jerusalem, and all Israel, those who are near and those who are far away, in all the lands to which you have driven them, because of the treachery that they have committed against you. 8 Open shame, O Lord, falls on us, our kings, our officials, and our ancestors, because we have sinned against you. 9 To the Lord our God belong mercy and forgiveness, for we have rebelled against him, 10 and have not obeyed the voice of the Lord our God by following his laws, which he set before us by his servants the prophets. Daniel’s petitions are based on the character of God (His greatness, awesomeness, faithfulness, righteousness, forgiveness, mercies) and on His interests (Your people, Your city, Your holy mountain, Your sanctuary). 11 “All Israel has transgressed your law and turned aside, refusing to obey your voice. So the curse and the oath written in the law of Moses, the servant of God, have been poured out upon us, because we have sinned against you. 12 He has confirmed his words, which he spoke against us and against our rulers, by bringing upon us a calamity so great that what has been done against Jerusalem has never before been done under the whole heaven. 13 Just as it is written in the law of Moses, all this calamity has come upon us. We did not entreat the favor of the Lord our God, turning from our iniquities and reflecting on his fidelity. 14 So the Lord kept watch over this calamity until he brought it upon us. Indeed, the Lord our God is right in all that he has done; for we have disobeyed his voice. 15 “And now, O Lord our God, who brought your people out of the land of Egypt with a mighty hand and made your name renowned even to this day—we have sinned, we have done wickedly. 16 O Lord, in view of all your righteous acts, let your anger and wrath, we pray, turn away from your city Jerusalem, your holy mountain; because of our sins and the iniquities of our ancestors, Jerusalem and your people have become a disgrace among all our neighbors. 17 Now therefore, O our God, listen to the prayer of your servant and to his supplication, and for your own sake, Lord, let your face shine upon your desolated sanctuary. 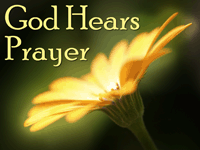 18 Incline your ear, O my God, and hear. Open your eyes and look at our desolation and the city that bears your name. We do not present our supplication before you on the ground of our righteousness, but on the ground of your great mercies. Here Daniel prays on firm New Testament ground. His confidence isn’t in his goodness, but in God’s goodness. And actually, this is what it means to pray in the name of Jesus. Those aren’t words we tack on to the end of a prayer, but they should express the fact we are praying in merits and righteousness of Jesus, not our own. “The Seventy Weeks” is a name often applied to Daniel 9:24-27, a prophecy that presumably, in contrast to the general prophecies in Daniel 2 and 7, pinpointed the exact time within the fourth kingdom when the Messiah would appear. Almost all scholars agree that the “weeks” designate 490 years. The prophecy is (1) divided–the successive periods are described as 7, 62, 1; (2) dated–“from” and “until” in 9:25; (3) determinative–Its purposes regard Israel (v. 24), redemption (v. 24), the Messiah (vv. 24, 26-27), the sacrifices (v. 27), and Jerusalem (vv. 25-27); and debated (see below). 20 While I was speaking, and was praying and confessing my sin and the sin of my people Israel, and presenting my supplication before the Lord my God on behalf of the holy mountain of my God— 21 while I was speaking in prayer, the man Gabriel, whom I had seen before in a vision, came to me in swift flight at the time of the evening sacrifice. 24 “Seventy weeks are decreed for your people and your holy city: to finish the transgression, to put an end to sin, and to atone for iniquity, to bring in everlasting righteousness, to seal both vision and prophet, and to anoint a most holy place. 25 Know therefore and understand: from the time that the word went out to restore and rebuild Jerusalem until the time of an anointed prince, there shall be seven weeks; and for sixty-two weeks it shall be built again with streets and moat, but in a troubled time. Gabriel’s message to Daniel is simple and striking. 483 years – that is, 69 units of seven years – would pass from the time of the command recorded in Nehemiah 2:1-8 until the appearance of Messiah the Prince. Messiah Cut Off. digital art by Ted Larson. and the troops of the prince who is to come shall destroy the city and the sanctuary. 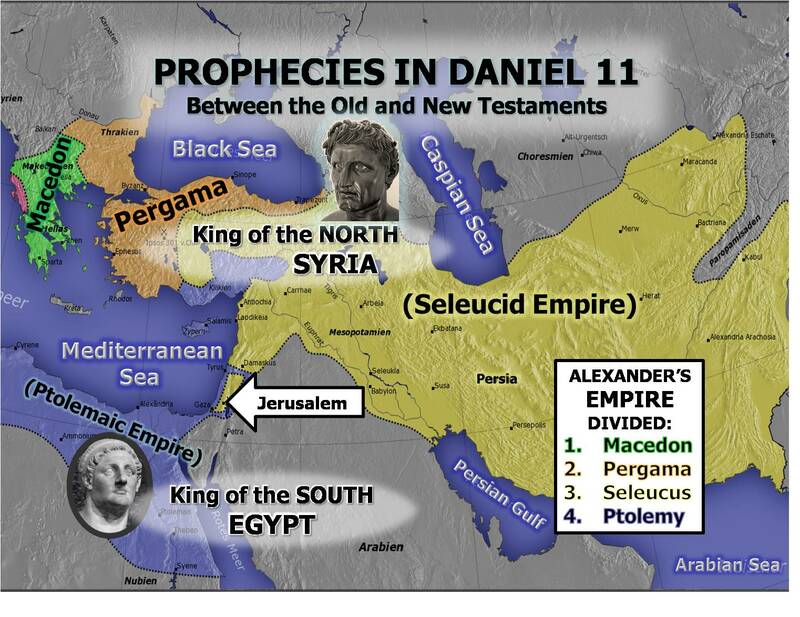 There are great numbers of books/charts/timelines purporting to interpret Daniel’s revelations. Just as a foretaste, go to Google Images and look up “Daniel’s Seventy Weeks” — you will see dozens of charts and interpretations! I do not claim to understand all the viewpoints, or even to give you a good representation of the various points of view. As Paul said in 1 Corinthians 2:2 — For I determined not to know any thing among you, save Jesus Christ, and him crucified. For that reason, I give you a song about our Savior, crucified and risen; desolations cease as we draw nearer to the Lord. HERE is “The Risen Christ” by Keith Getty and Phil Madeira. This vision happened while Babylon was securely in power. Though the vision will deal with the emergence and destiny of the Greek Empire, the Greek Empire was not much of anything at the time the prophecy came to Daniel. a vision appeared to me, Daniel, after the one that had appeared to me at first. 2 In the vision I was looking and saw myself in Susa the capital, in the province of Elam, and I was by the river Ulai. 3 I looked up and saw a ram standing beside the river. Vision of the Ram. digital art by Ted Larson. It had two horns. Both horns were long, but one was longer than the other, and the longer one came up second. 4 I saw the ram charging westward and northward and southward. All beasts were powerless to withstand it, and no one could rescue from its power; it did as it pleased and became strong. 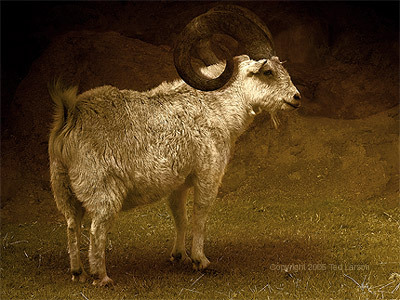 In this same chapter (Daniel 8:20) this ram was clearly identified as representing the Medo-Persian Empire, which succeeded the Babylonian Empire. The ram was noted for the proportion of its two horns — one was higher than the other. This was an accurate prediction of the partnership between the Medes and the Persians, because the Persians were larger and stronger in the partnership. They also emerged after the Medes (the higher one came up last). 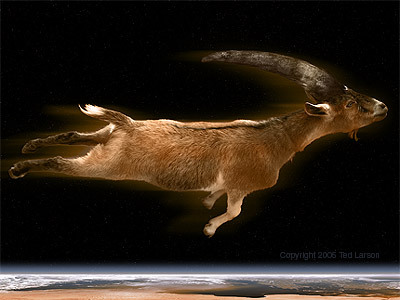 5 As I was watching, a male goat appeared from the west, coming across the face of the whole earth without touching the ground. From ancient history we know the goat was a common representation of the Greek Empire. Vision of the Goat. digital art by Ted Larson. The goat had a horn between its eyes. 6 It came toward the ram with the two horns that I had seen standing beside the river, and it ran at it with savage force. 7 I saw it approaching the ram. It was enraged against it and struck the ram, breaking its two horns. The ram did not have power to withstand it; it threw the ram down to the ground and trampled upon it, and there was no one who could rescue the ram from its power. 8 Then the male goat grew exceedingly great; but at the height of its power, the great horn was broken, and in its place there came up four prominent horns toward the four winds of heaven. The Greek Empire rose from the west of previous empires. The Greek Empire rose with great speed; Alexander defeated the Persian Empire in only three years. (suddenly . . . without touching the ground). 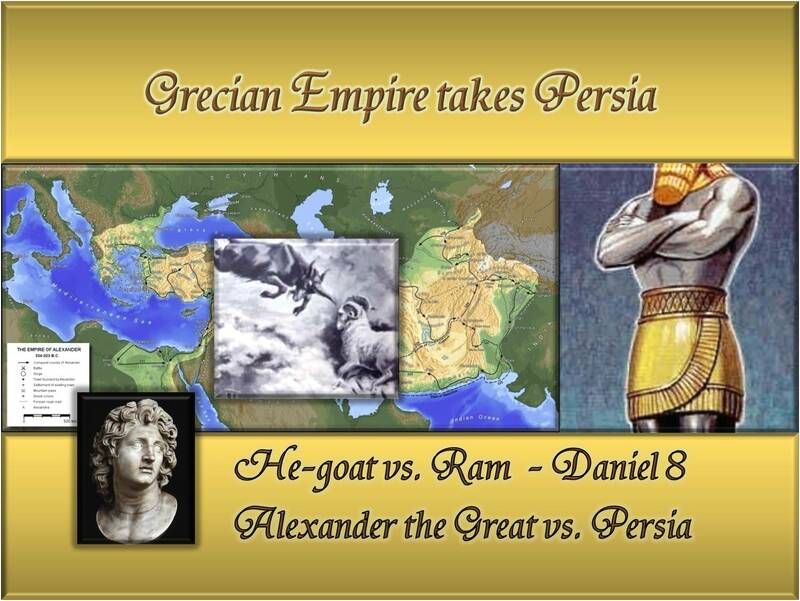 The Greek Empire had a notable ruler, Alexander the Great (a notable horn). The Greek Empire had a famous war with the Medo-Persian Empire (I saw him confronting the ram). The Greek Empire and the Medo-Persian Empire greatly hated each other (with furious power . . . moved with rage). Some of the greatest, fiercest battles of ancient history were fought between the Greeks and the Persians. The Greek Empire conquered the Medo-Persian Empire (no one that could deliver the ram from his hand). 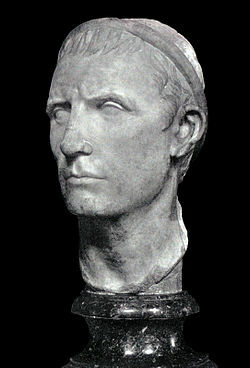 The reign of the notable leader of the Greek Empire was suddenly cut short when Alexander died at age thirty-three (the large horn was broken). After the end of Alexander the Great’s reign, the Greek Empire was divided among four rulers (in place of it four notable ones came up). The four rulers of the Greek Empire after Alexander ruled their own dominions, not the entire empire together (came up toward the four winds of heaven). The greatness of Alexander’s Empire was not only in its vast dominion but also in its cultural power. Alexander the Great was determined to spread Greek civilization, culture, and language across every land he conquered (the male goat grew very great). As God guided history, He used Alexander’s passion to spread Greek culture to prepare the world for the Gospel of Jesus Christ. Because of Alexander’s influence, koine (common) Greek became the common language of the civilized world – and the language of the New Testament. 9 Out of one of them came another horn, a little one, which grew exceedingly great toward the south, toward the east, and toward the beautiful land (note: Palestine). 10 It grew as high as the host of heaven. It threw down to the earth some of the host and some of the stars, and trampled on them. 11 Even against the prince of the host it acted arrogantly; it took the regular burnt offering away from him and overthrew the place of his sanctuary. 12 Because of wickedness, the host was given over to it together with the regular burnt offering; it cast truth to the ground, and kept prospering in what it did. Antiochus IV Epiphanes attempted to abolish traditional Jewish worship and Hellenize the Jewish people by force. He blasphemed the Lord, caused the sacrifices to cease in Jerusalem, and desecrated the temple by offering a pig on the altar in the Most Holy Place. He burned copies of Scripture. By some estimates he was responsible for the murder of more than 100,000 Jews. All this he did with apparent success. Gabriel and Daniel in the Citadel. digital art by Ted Larson. 18 As he was speaking to me, I fell into a trance, face to the ground; then he touched me and set me on my feet. 19 He said, “Listen, and I will tell you what will take place later in the period of wrath; for it refers to the appointed time of the end. 20 As for the ram that you saw with the two horns, these are the kings of Media and Persia. 21 The male goat is the king of Greece, and the great horn between its eyes is the first king. 22 As for the horn that was broken, in place of which four others arose, four kingdoms shall arise from his nation, but not with his power. So is this prophecy fulfilled already? Or, as the angel says, is it for the end times? The prophecy in this passage below reads equally true of both Antiochus and Antichrist. This is an example of a prophetic passage that has both a near and far fulfillment. and shall succeed in what he does. and the people of the holy ones. and in his own mind he shall be great. and shall even rise up against the Prince of princes. But he shall be broken, and not by human hands. 27 So I, Daniel, was overcome and lay sick for some days; then I arose and went about the king’s business. But I was dismayed by the vision and did not understand it. Daniel probably couldn’t understand why God would allow such a mighty persecutor of His people to come to power and seeming success. The hymn “God Moves in a Mysterious Way” was written by William Cowper (1731-1800). It is re­port­ed­ly the last hymn Cow­per ev­er wrote, with a fas­cin­at­ing (though un­sub­stan­ti­at­ed) story be­hind it. HERE is Lori Sealy singing a hymn that Daniel would surely understand. The Ancient of Days. digital art by Ted Larson. Here is the traditional Christian interpretation of this chapter: It is very clear that the history of the world, from Babylon to Christ’s second coming, is given in Daniel 7 as in Daniel 2. There were to be but four universal kingdoms until the setting up of God’s kingdom, according to Daniel 2; history has confirmed this story. Since Daniel 7 also gives us four and they are presented as succeeding one another (Daniel 7:4-7,23), it is evident that we are dealing with Babylon, Medo-Persia, Greece, and Rome. Daniel chapters 1 through 6 describe the life and times of Daniel. Chapters 7 through 12 describe visions Daniel had. In order of events, the vision described in Daniel 7 took place during the time between Daniel chapters 4 and 5. This first vision — one of four described between Daniel 7 through 12 — was the most comprehensive. The other three visions go into greater detail within the general framework of this first vision. 2 I, Daniel, saw in my vision by night the four winds of heaven stirring up the great sea, 3 and four great beasts came up out of the sea, different from one another. 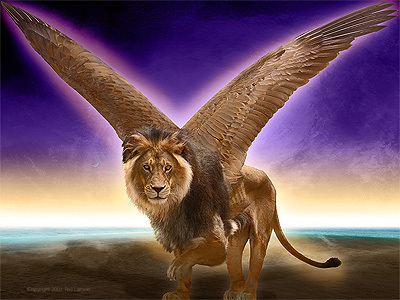 4 The first was like a lion and had eagles’ wings. The Lion with Wings. digital art by Ted Larson. Then, as I watched, its wings were plucked off, and it was lifted up from the ground and made to stand on two feet like a human being; and a human mind was given to it. 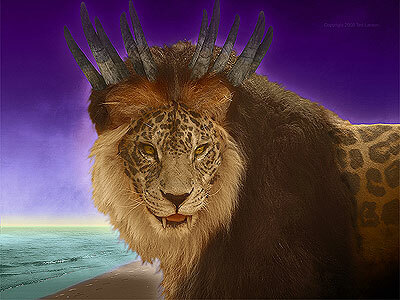 The first beast was more majestic than any of the following beasts (lions and eagles are “kings” of their realms). But this majestic beast was humbled (wings were plucked off) and made human (a man’s heart was given to it). 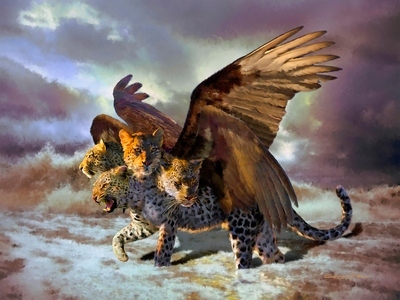 A little later (Daniel 7:17) Daniel tells us that these four beasts are four kingdoms ruling over the earth. The first kingdom is the Babylonian Empire, represented by a lion and an eagle. This fits in well with the majesty and authority of Nebuchadnezzar in his reign over the empire of Babylon. Jeremiah used both the lion and the eagle as pictures of Nebuchadnezzar (Jeremiah 49:19-22), and Babylon’s winged lions can be seen at the British Museum today. 5 Another beast appeared, a second one, that looked like a bear. The bear represented the Medo-Persian Empire, succeeding the Babylonian Empire. In this partnership between the Medes and the Persians, the Persians dominated the relationship. Most think the three ribs represent their three great military conquests: Babylon, Egypt and Lydia. The slow, crushing armies of the Medo-Persian Empire were well known. They simply overwhelmed their opponents with superior size and strength. 6 After this, as I watched, another appeared, like a leopard. The beast had four wings of a bird on its back and four heads; and dominion was given to it. The leopard was known for its sudden, unexpected attacks. This one was especially swift (with four wings), and clever (having four heads). After his sudden death at age thirty-three, his empire was divided into four parts (four heads). Specifically, the four heads were Casander, Lysimachus, Seleucus, and Ptolemy, who inherited Alexander’s domain after his death. 7 After this I saw in the visions by night a fourth beast, terrifying and dreadful and exceedingly strong. 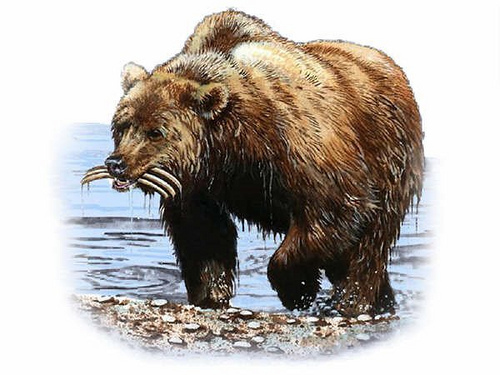 It had great iron teeth and was devouring, breaking in pieces, and stamping what was left with its feet. It was different from all the beasts that preceded it, and it had ten horns. The Beast with Ten Horns. digital art by Ted Larson. 8 I was considering the horns, when another horn appeared, a little one coming up among them; to make room for it, three of the earlier horns were plucked up by the roots. There were eyes like human eyes in this horn, and a mouth speaking arrogantly. The fourth beast was indescribable, and uniquely horrific in its power and conquest. In the ancient world horns expressed the power and fearsomeness of an animal. This fourth beast was so strong it had ten horns. In historical fulfillment, the fourth beast represents the Roman Empire, which was the largest, strongest, most unified and enduring of them all. The Son of Man. digital art by Ted Larson. The divine interpretation of the dream shows that this vision covers the same material as Nebuchadnezzar’s vision in Daniel 2, which also described the rise of four empires, which are succeeded by the kingdom of God. Yet Daniel’s vision was different, seeing the kingdoms from God’s perspective, not man’s. Nebuchadnezzar saw the present and future world empires in the form of a stately and noble statue of a man. Here God showed how He regarded them: as ferocious and wild animals who devour and conquer without conscience. 19 Then I desired to know the truth concerning the fourth beast, which was different from all the rest, exceedingly terrifying, with its teeth of iron and claws of bronze, and which devoured and broke in pieces, and stamped what was left with its feet; 20 and concerning the ten horns that were on its head, and concerning the other horn, which came up and to make room for which three of them fell out—the horn that had eyes and a mouth that spoke arrogantly, and that seemed greater than the others. 21 As I looked, this horn made war with the holy ones and was prevailing over them, 22 until the Ancient One came; then judgment was given for the holy ones of the Most High, and the time arrived when the holy ones gained possession of the kingdom. There was much interest in all these four beasts, but Daniel was especially interested in the fourth, most terrible beast – and especially about its conspicuous horn. These ten kings do not have a literal fulfillment in the Roman Empire of history. If they are literal, they are still in the future. In the day of persecution by this blasphemous ruler, the Messiah will establish His kingdom for His people.